We all know how necessary it is to have our keys where we personally can get them. They hold a vital role in the security of our property. Even so, as professional locksmith in Portland company, we find that proper key management is overlooked and oftentimes given to human error. An organization who is looking to track and control the access to important keys should definitely consider selecting and utilizing a key management system. As mentioned earlier, human error is often the best reason to use key management. Small things such as transposed or incorrect numbers along with illegible handwriting are not uncommon and only increase the chances of error. Also, forgetting to lock the key cabinet after removing or returning keys can make it possible for anyone to have access to the cabinet without logging the activity. When a key goes missing, determining who had it last requires a time-consuming process of searching to identify who signed it out last. Even then, that individual must be located to find out if he or she simply forgot to return the key to the cabinet or if it may have been lost or stolen. In the meantime, there may be a key out there that could possibly be used by unauthorized individuals. Large security risks like these can easily be avoided. Technological advances in key management solutions greatly eliminated most of the potential for human error. 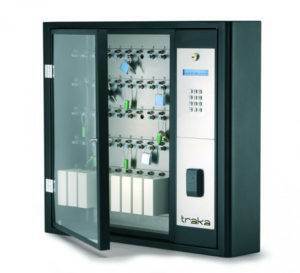 These automated key management systems bring high-tech to the world of every-day physical keys. Automated access control systems with fail-safe features for key management maintain a perfect record of all of the keys that were taken out and returned. These automated systems control who can access which keys and at what time of day by providing each user a personal PIN code, biometrics or other proven ID method. For incidents such as a key not being returned on time, the system will generate an alarm that allows security and management to immediately determine what happened. Using a combination of advanced technologies, these solutions significantly lower and in many cases even eliminate the possibility of human error present in manual key management processes. An automated key management system increases the speed, efficiency and accuracy of verifying that an individual is authorized making your commercial property more safe and secure.